Still-life with bird, flowers and fruits, attributed to Carl Balsgaard 1812-1893. Window with mountain view, professionally restored. A still-life with pomegranate, jug and glass etc Indistinctly signed possibly Jerichau. France still life with fruits and copper plate, frame with pomegranates - Signed low to the left - O/7133 - Dimensions: canvas cm. 87 x70 H. Frame cm. 102 x 85 H.
Oil on canvas, work made in Austria in the 1960s. Signed on the corner by unknown artist. “European School: Classical Still Life with Birds and Fruit” painting, oil on canvas, unsigned. A. Nilsson Sweden: Still life with fruits. Oil on canvas. Signed: A. Nilsson. Measures: 41 cm x 36 cm. The frame measures: 6.5 cm. In very good condition. Cheerful and sunny painting with fruits and flowers from Italy - Neapolitan painter - Hand painted green wooden frame - O/6763. 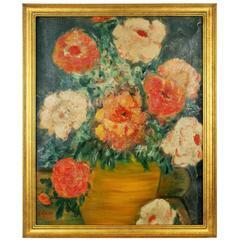 #5-2736, an Impressionistic style flowers still life, original oil on artist board, signed lower left by L.Gilda. Displayed in a wood gilt frame. 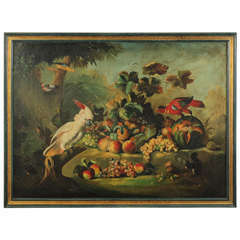 Image size 19.5 H x 15.5 W.
Oil on canvas painting featuring a fruit and fowl still life. 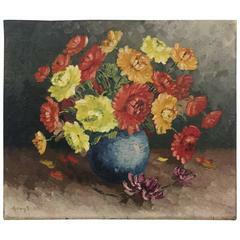 We present you this oil on wooden panel from the second half of the 20th century. The author is unknown. Dimensions with frame: 34 x 41 cm.